1. C5 class ballscrew and servo motor for vertical transmission.Digital control by Equiptop designed program with MitsubishiPLC. Selection menu for Equiptop surface and plunge grinding,mechanical coordinates, working coordinates, grinding control points, input and output points...etc. 2. Auto wheel dressing and compensation system on table.Table positioning on left side for wheel dressing. 3. Digital readout feedback for cross positioning setting. Three-section setting value for cross movement to fit rough,finish, and micro grinding. 4. Spindle seat with water cooling system to ensure stability ofaccuracy. 5. 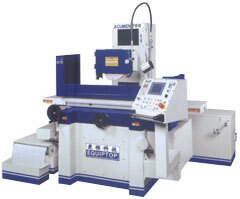 Three axes fully automatic surface grinding with NC control. Servo system for vertical transmission. 16-color touch screen, spindle current meter, and magnetic power volt meter. 6. Minimum setting value for vertical downfeed is 0.0001mm. 7. Minimum display value for cross movement is 0.001mm. 8. Optional wheelhead auto wheel dressing and compensation system or diamond forming dressing and compensation system. 9. Humanized man-machine touch screen. Grinding spindle drive Speed 60HZ,1750 R.P.M. ;50HZ,1450 R.P.M.